Bjork, whos real name is Bjork Gudmundsdottir (and it's pronounced "b y e r k"), has scored with her album Telegram--industrial music and synthesizer pop remixed from her earlier "Post" album--and has just released Homogenic. Bjork is Icelandic. She was born in Reykjavik (Iceland's capital city) and has lived there all her life, up until 1993 when she decided to move to London. 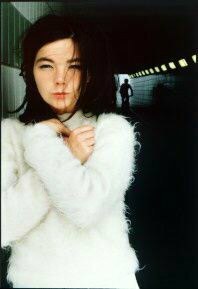 32 years old and winner of the Brit Award for Best International Performer and the MTV European Music Award for Best International Female Artist, Bjork says that while she doesn't follow a specific religion, she is very religious. She believes in herself. Björk also privately publishes a booklet of stories and watercolors. hear sound samples from Telegram, or see a concert movie of her from The Wembley Arena in 1996.